"While having a strong understanding of finance and economics has been very helpful in my role, the critical thinking and communication skills I developed at UC Davis have been equally important." "I felt like when I graduated, I could do anything." 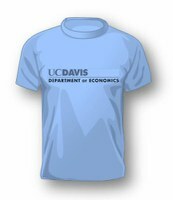 "Studying Economics at UC Davis prepared me to look beyond the numbers when reviewing my work." "I think the biggest thing about school at Davis is that you learn how to learn. Almost every class I took had some sort of impact on preparing me for post-college life." "Take advantage of whatever opportunities you have at Davis, whether academic or extracurricular." "One of the most important things that UC Davis taught me was how to be an informed consumer of research." "The opportunity to focus on the study of economic inequality and social mobility within the Economics program has proved particularly helpful to my work." "My UC Davis education helped me develop a routine of discipline, allowed me to learn the fundamentals of economic research (especially econometrics), and helped me develop my writing skills for professional-level writing."